Most of the tournament focus is on Las Vegas and the World Series of Poker at the moment but there's been plenty of top action on this side of the Atlantic. A case in point being the latest joint venture between the PokerStars UK and Ireland Poker Tour (UKIPT) and Spain's Estrellas Tour. A bumper field of 815 players took to the tables for the €1,100 Main Event in Marbella with Isidoro Barrena eventually taking the honours. 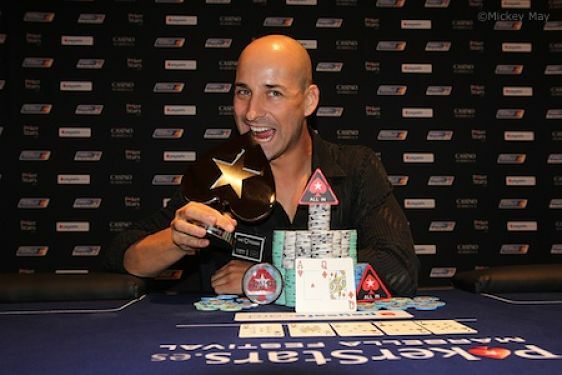 The Spaniard topped a final table that included Holland's Jeffrey Brouwer, Austria's David Vedral and British Poker Award winner Sam Grafton before seeing off compatriot Jose Angel Latorre. After a swingy heads up battle which saw the lead change several times, it took something of a cooler to split the two Spanish players. Latorre was at risk, all-in with AJ against Barrena's AQ. A queen on the flop sealed the deal and gave Barrena a career-best payout of €150,800. Next stop on the UKIPT calendar is Bristol from 6-9 August. Qualify online at PokerStars. UKIPT Marbella Final Table results. Image courtesy of Mickey May @ PokerStars Blog.